What is it about snowflakes that makes us happy? Is it the delicate look? Is it softness? Is it that no two snowflakes are alike? 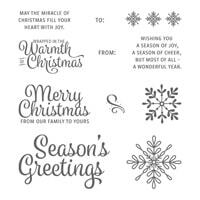 I am excited to share this new bundle from the 2017-2018 Holiday catalog called Snowflake Sentiments. 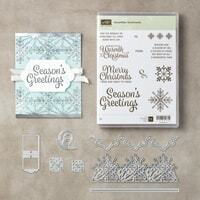 Here are some fabulous samples showcasing the Snowflake Sentiments Bundle. I will have more ideas using this bundle in the future too so keep watching for more! How about a quick video showcasing this bundle? Let’s go! I love how there are sentiments for the outside of the card AND the inside! These dies are just stunning! The snowflakes are a perfect fit for a 5 ½” card base. That little swirl in the bottom left corner has a lot of uses too. I’ll share more about that one in my Facebook Live tonight. To add the Snowflake Sentiments to your next order, just click a pic! I am a busy little bee getting ready for tonight’s FACEBOOK LIVE party! Are you ready to join me for a fun night of stamping? My theme for tonight is MORE THAN CHOCOLATE. 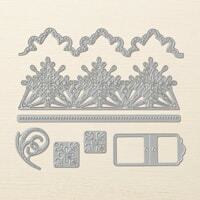 This stamp set is a little hidden gem in our catalog. I just got this stamp set and I am having the BEST time creating with it. Here’s a little sneak peek at what I will be sharing on tonight’s Facebook Live. Can’t make it tonight? Not a problem! I will be sharing the videos for the projects over the next couple days. Want notifications on my Facebook LIVE events? CLICK HERE and LIKE my page! You will get notifications of when I am LIVE! Well, I better get a move on. I have a lot of work to do to get ready for tonight. You won’t want to miss it! See you tonight over on my Facebook page! Use the OCTOBER HOST CODE EERAKVCP on your order of $30* or more and I have an incredible pdf tutorial along with exclusive video links just for you. The Flash Card Gimme a Kiss video & tutorial collection is 15-pages of instructions, photos, diagrams, tips, tricks, and general awesomeness so that you can create 4 different Flash Card Hershey Kiss boxes PLUS a bonus tutorial for the Hershey Kiss Daisy bouquet! Remember, if your order is over $150.00*, DON’T use the Host Code and earn Stampin’ Rewards (Rewards start at $15) plus you’ll also receive the videos & tutorials! BIG win!!! Want to order the FLASH CARD GIMME A KISS TUTORIAL collection? Click here!